Provided photo Members of the State Equine Management team were, left to right, Jessica Copeland, Liza Bair, and Marisa Savini. Provided photo Members of the State Livestock team were, front row, left to right, Emma Sutherly, Libby Carpenter, Paige Pence, and Kylie Blair. Back row, Samuel Sutherly, Chloe Gump, Lauren Wright, Jarrett Winner, and Adam Bensman. CASSTOWN — The Miami East-MVCTC FFA Chapter members wrapped up a spring season of career development events. Members offer a special thank you goes to the practice sites for the teams. The Livestock Team practiced at Double E Dorset Farm, Team Sutherly Goats, Cron Show Pigs, and Shane Show Cattle. 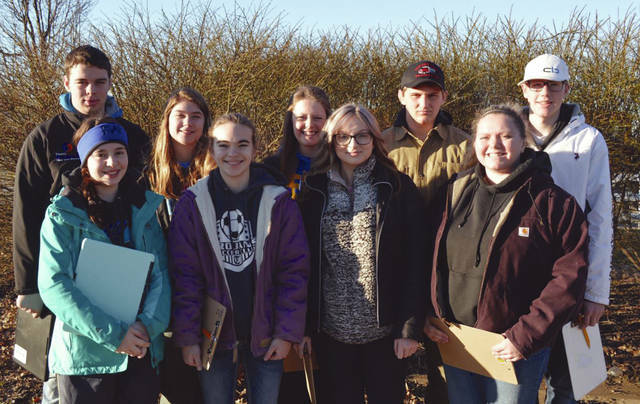 On March 2 at the Marysville/Champaign County Invitational in Marysville, the General Livestock team placed 21st out of 119 teams with members Isaac Beal, Samuel Sutherly, Chloe Gump, Libby Carpenter, Kylie Blair, Ethan Paulus, Ethan Fine, and Lauren Wright. Isaac Beal was the highest placing individual from Miami East at 69th out of 639 contestants. On March 9 at the Miami Trace Invitational in Washington Courthouse, the Equine Management team consisted of Marisa Savini, whom placed 19th out of 127 individuals. The General Livestock Judging Team consisted of Isaac Beal, Ethan Paulus, Adam Bensman, Lauren Wright, Samuel Sutherly, Chloe Gump, and Paige Pence. The team placed 14th out of 81 teams. Isaac Beal placed 33rd out 510 contestants and was the highest placing individual from Miami East. On March 16 at the Mercer County Invitational in Celina, the Equine Management Team consisted of Jessica Copeland and Marisa Savini. The team placed 18th. Jessica Copeland was the highest individual from Miami East placing third out of 97 individuals. The General Livestock Team placed 12th out of 61 teams. Team members were Isaac Beal, Libby Carpenter, Chloe Gump, Lauren Wright, Ethan Fine, Jarrett Winner, Ethan Paulus, and Blake Boggess. The highest individual from Miami East was Isaac Beal who placed seventh out of 321 individuals. At the State Spring Career Development Event on March 23 at the Ohio Expo Center/State Fairgrounds in Columbus, the season finished. The Equine Management Team consisted of Jessica Copeland, Liza Bair, and Marisa Savini. The team placed 72 out of 118 teams. Jessica Copeland was the highest placing individual from Miami East and placed 54 out of 425 individuals. The General Livestock Team consisted of Emma Sutherly, Paige Pence, Jarrett Winner, Lauren Wright, Libby Carpenter, Sam Sutherly, Chloe Gump, Kylie Blair, and Adam Bensman. The team placed 35 out of 175 teams. Emma Sutherly was the highest placing individual from Miami East and placed 180 out of 978 individuals. 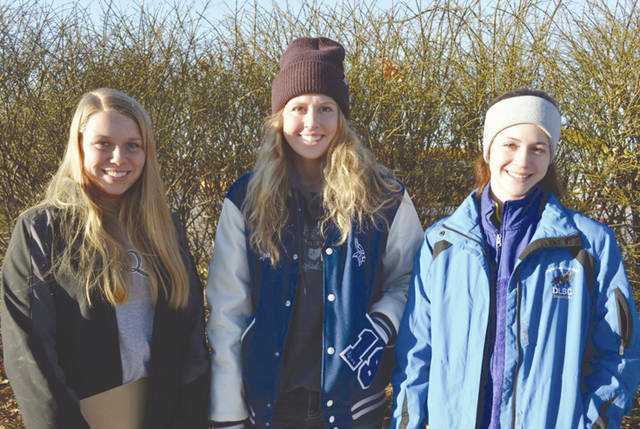 https://www.dailycall.com/wp-content/uploads/sites/30/2019/03/web1_State-Equine-Team.jpgProvided photo Members of the State Equine Management team were, left to right, Jessica Copeland, Liza Bair, and Marisa Savini. https://www.dailycall.com/wp-content/uploads/sites/30/2019/03/web1_State-Livestock-Team.jpgProvided photo Members of the State Livestock team were, front row, left to right, Emma Sutherly, Libby Carpenter, Paige Pence, and Kylie Blair. Back row, Samuel Sutherly, Chloe Gump, Lauren Wright, Jarrett Winner, and Adam Bensman.